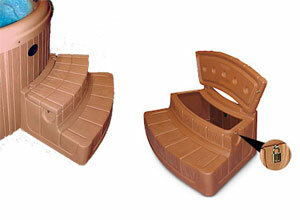 Easy access - Visually appealing rectangular steps in colors that complement your spa. Strong support - There is no sag or sway when you use the steps. You won't feel like it is about to collapse with every step. Minimal maintenance - Cleanup is easy. 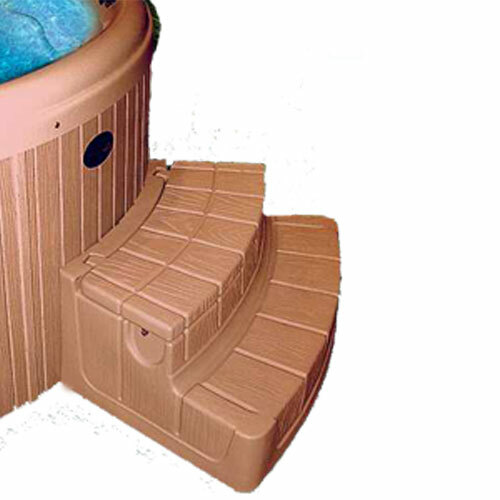 Simply spray the steps inside and out with a water house. A drain plug is installed in the storage base. Dry storage - Water resistant lid closure to keep items inside dry. Slip-free steps - The simulated wood grain finish gives the steps the look of wood without getting slick. The color is pigmented throughout the material so it won't wear off. Stability - Self-leveling pads at each corner keep the steps in place and ensure an extremely stable platform. Durability - The steps are rotocast of UV-stabilized and recyclable high-impact material. They are designed to withstand the most severe weather conditions year after year. Secure Storage - Keep chemicals or valuables secure with the lock feature. Simply add a padlock to limit access. Height (floor to top step): 17"